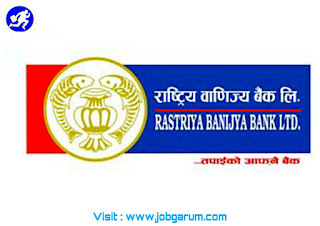 Latest Job News :- Rastriya Banijya Bank (RBB ) | Civil Bank Limited | BBS 2nd Year [ 4years ]Result Published !!!! Sunrise Bank Limited is a fast Growing “A” class commercial bank with diversification to various areas of function and expansion aim's to increase the place of quality growth in the coming year's. In this process the bank requires pool of Competent Human Resource to surpass the targeted quality growth in an effective, efficient and sustainable manner. Candidate's should have experience ranging from 2 to 5 year's depending on the position's applied. Candidate's must be working at same positions or one level below with at least 1 year of experience in current position's to apply in the desired position's. Candidate's can applying for Officer Level and above should have minimum master degree . Supervisor and below level should have minimum bachelors degree from recognized university. Should have good exposure in Branch Operation's/Credit/Sales knowledge . Sound knowledge of regulatory requirements including internal and external reporting. Should have excellent written and spoken in English/Nepali. The candidate's should clearly mention the name of the Branch locations with Positions applying for in the CV.Position's shall be offered as per the profile of the candidate's. For Local candidate's will be given preferences . Candidate's meeting the above mentioned qualification's and criteria can apply through within given Deadline.